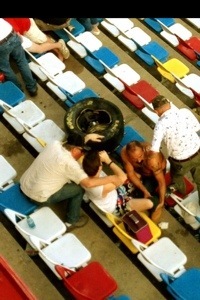 (CNN) – Debris flew into the stands, injuring some spectators, during a crash Saturday during the final turn of a NASCAR race at Daytona International Speedway. 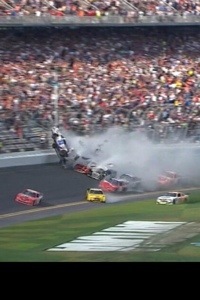 The multi-car crash occurred near the end of the Nationwide Series race at the same Florida track where Sunday’s Daytona 500 will be held. The impact caused material to soar into various places, some of it reaching the second level of the stands about 20 feet up. 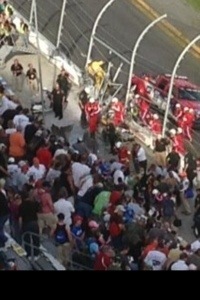 An engine was among the parts that broke loose and plowed into the protective fence separating the track from spectators. Afterward, several spectators could be seen lying down after apparently suffering injuries. It was not immediately known how severe the injuries might be. NASCAR president Mike Helton later told ESPN, which was broadcasting the race, some people were being taken to Halifax Medical Center. He said the protective fence did its job in preventing potentially more injuries and possibly deaths. “There are moments that occur we have never seen before,” Helton said. 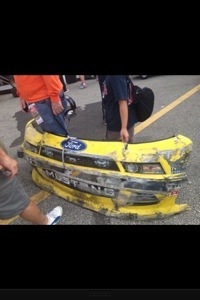 Maybe Danica had a guardian angel over her today with an engine failure. 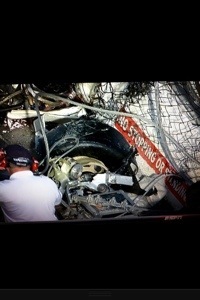 Prayers to fans and drivers. And a shout out to Daytona crew who have their work cut out for them to pull off the Daytona 500 tomorrow!